In this guide, we focus on elements of learning and assessment design that research tells us are significant in both the higher and further education and skills sectors. Drawing on interviews with staff in colleges and universities, and a decade of research into technology-enhanced curriculum design, we explore how digital tools can make a difference to the art of learning design. Read on to find out more about learning design or jump straight into a section for content and examples under the four areas reflected in our latest model. Learning design is a considered, creative process that occurs within a wider eco-system of people, processes, systems and places, in which one element is dependent on the others. As these elements change, and the technologies available to us increase, engaging with an iterative process of creating and redesigning programmes, modules and learning activities becomes ever more important. The following diagram, updated from effective practice in a digital age (2007), illustrates the key factors likely to influence this process. At the centre is activity: interaction of learner(s) with environment leading to planned outcomes supported by other people in specific roles. Linking learning environment and intended learning outcomes is impact of learning environment on learning outcomes. 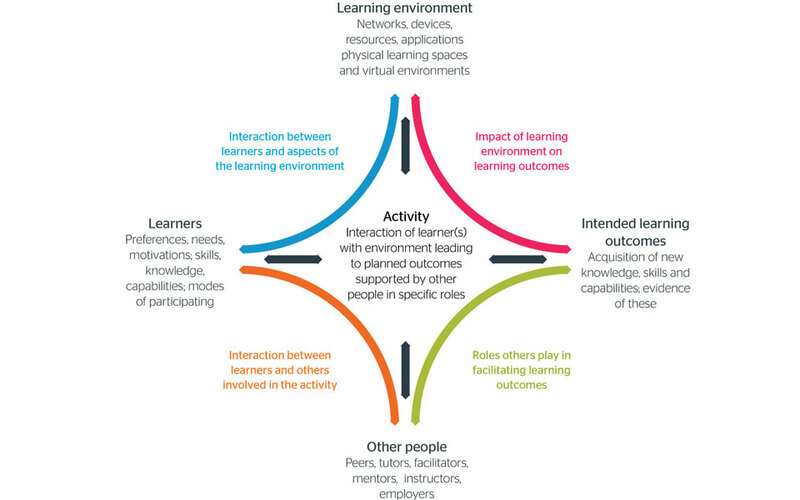 Linking intended learning outcomes and other people is the the roles others play in faciliating learning outcomes. Linking other people and learners is the interaction between learning and others involved in the activity. Linking learning environment and learners is interaction between learners and aspects of the learning environment. An appreciative inquiry approach means considering what you already do well and how you might be inspired further by the resources in this guide. In this guide, we use the lens of appreciative inquiry to help you apply what we have learnt in your own context. “Discovering what worked well in the past reminds us that we can bring about positive assessment and feedback experiences for ourselves and our students. Building on these capacities, envision how you can position yourself to embrace assessment and feedback in a more positive way in the future. 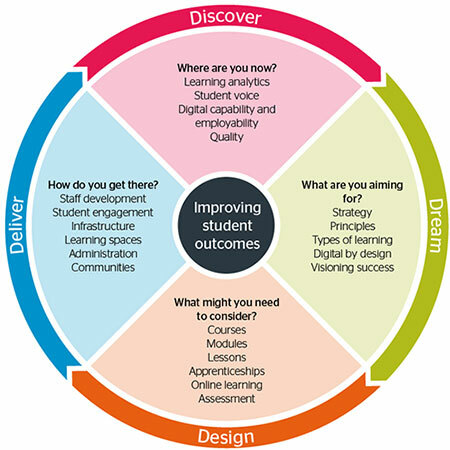 The headings Discover, Dream, Design, Deliver used in our 2018 model of learning design are drawn from the appreciative inquiry approach to change. Find out more in the appreciative inquiry chapter of our change management guide. View our learning design family tree (pdf) for an at-a-glance view of the main outcomes from our past projects and their links to other key developments in learning and assessment design between 2006 and 2014.